The Mobile Service Tower (MST) is rolled back at Space Launch Complex-6 in preparation for launch of a United Launch Alliance Delta IV Heavy rocket carrying the NROL-65 mission for the National Reconnaissance Office. 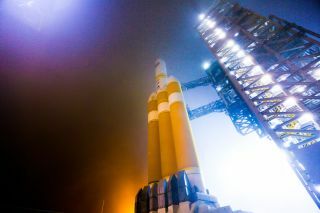 Igniting its three main engines in a staggered sequence for the first time, a United Launch Alliance Delta 4-Heavy rocket for U.S. national security is scheduled for liftoff from California today (Aug. 28). The Delta 4 rocket family. The six previous launches of Delta 4-Heavy rockets — five from Cape Canaveral and one from Vandenberg — commanded all three engines to ignite simultaneously. "There's nothing bigger that the United States launches — period — in any way, shape or form, and that is absolutely amazing," said Lt. Col. Jim Bodnar, commander of the 4th Space Launch Squadron at Vandenberg. A lengthy series of readiness reviews ranging from subsystems to the payload has been underway since last week. The assessments culminate with the final launch approval to be given Tuesday, Bodnar said.